Our body requires a few essentials in order to keep us going. Water, vitamins and nutrients are the staples we need to stay healthy. But did you know that our body also needs seven essential minerals? These minerals include sodium, potassium, magnesium, chloride, calcium, phosphorus and sulfur. Minerals can be divided into two groups: Major minerals (macrominerals) and minor minerals (microminerals). Both groups are essential for our body to work at its best and perform its daily functions. We can get these minerals through our diet, but if we don’t follow a healthy balanced diet, it can lead to a deficiency. One mineral deficiency in particular is magnesium, and as it’s the fourth most important mineral in the body, it’s important to always have the right amount. In fact, magnesium is so important that it plays a role in more than 300 biochemical reactions in the body, playing a role in good muscle and nerve function, heart rhythm and a healthy immune system. It’s said to be the most neglected mineral – yet we can’t live without it. So what exactly is magnesium responsible for? Well, for starters, magnesium can mostly be found within our teeth and bones, and the remainder resides within our muscles and cells. Magnesium plays a role in the creation of ATP – the body’s energy currency. Magnesium also works in large part with calcium – another essential mineral. Without it, calcium can become imbalanced in the body, leading to calcification and cell death. Magnesium also helps our bodies remain in a calm, relaxed state. Our organs rely heavily on magnesium to function. In particular, our brain and our hearts are two main organs which can’t function without it. So a deficiency in this essential macromineral could severely disrupt our bodies. As we said, magnesium can be consumed through diet, but certain dietary choices can be causes of magnesium deficiency. For example, high consumption of caffeine, sugar, processed foods and alcohol are all dietary causes of magnesium deficiency. Prescription drugs like diuretics, insulin, hypertension medicine, and some antibiotics can also be causes of magnesium deficiency. Another cause is over-consumption of other minerals, such as calcium. Because magnesium works to keep calcium balanced, supplementing too much calcium can still cause an imbalance. When we take in more calcium, our need for magnesium also increases. If we have a deficiency in magnesium, though, then the body cannot properly deal with the influx of calcium. It’s not properly absorbed and used. Therefore, it is recommended when taking calcium, you also take magnesium simultaneously to keep the two in balance. Now that we have a better understanding of how important magnesium is, would you even know if you had a deficiency? Probably not. Here are some magnesium deficiency symptoms you should look out for: Weakness, muscle cramps, tremors, nausea, anxiety, high blood pressure, respiratory issues, dizziness, poor memory, confusion and difficulty swallowing. In other words, you’ll probably know something’s wrong. If you already have type 2 diabetes, poor heart health, or calcium or potassium deficiency, be aware that magnesium deficiency could be a contributing factor. As you can see, magnesium deficiency symptoms closely resemble symptoms to many other illnesses. Therefore it’s important that if you are experiencing any of these magnesium deficiency symptoms, you get them checked out to know for sure. So how is magnesium deficiency harmful? There is quite the list of ailments related to magnesium deficiency. Some of these ailments are poor quality sleep, abnormal blood pressure, asthma, weight gain and improper digestion. The U.S. National Library of Medicine with the National Institutes of Health (NIH) reports that another ailment related to magnesium deficiency has to do with our bones. Because magnesium is found mostly in our bones, a magnesium deficiency can be a negative. In fact, NIH says that a magnesium deficiency has been found among people with osteoporosis. Further ailments related to magnesium deficiency is chronic fatigue syndrome (CFS) and a susceptibility to infection and migraines. Studies have shown that magnesium deficiency was identified among those with chronic fatigue syndrome. CFS can cause alterations in mood as well as lethargy over long periods of time. Although there are parts of our diet linked to magnesium deficiency, here is how to naturally supplement magnesium. First off, enjoy a diet rich in leafy green vegetables, seeds, nuts and whole grains. These are all food items which can naturally supplement magnesium. 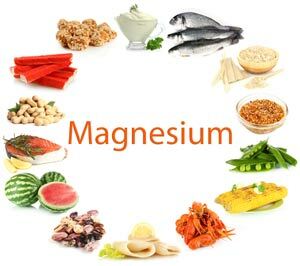 Try the following, in particular: Pumpkin seeds, sunflower seeds, black beans, spinach, squash, almonds, and cashews to naturally supplement magnesium easily through diet. Just as you’re likely conscious of taking in enough vitamin C, calcium and vitamin D, you should now be more aware of the important of magnesium. Even if you’ve only heard of it before, you now have a better understanding of how important magnesium is to your body as a whole. If you’re concerned you may have a magnesium deficiency, or have been feeling some of the magnesium deficiency symptoms, your doctor can easily check your levels through blood work to give you a better idea. Lastly, keep in mind that although your body will release extra magnesium, there still can be some side effects linked to too much. Therefore, naturally supplement magnesium through diet and try not to overdo it.